BTXpress Cytofusion® Medium C is an advanced electrofusion buffer designed especially for hybridoma production. The low conductivity buffer is specially formulated to minimize cell turbulence during cell alignment and heating during electrofusion, for robust cell fusion efficiency and high cell viability. 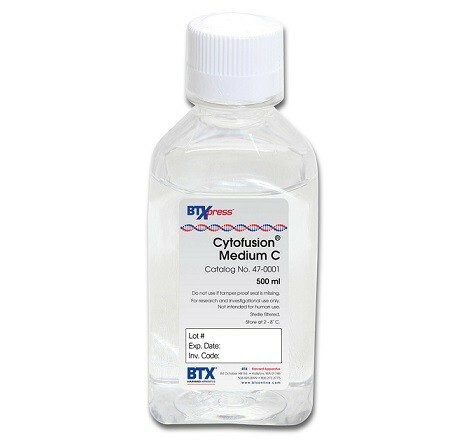 BTXpress Cytofusion Medium C is sterile filtered from the highest quality non-animal, medical-grade reagents. It is the buffer of choice for many commercial biotech and pharmaceutical companies in their hybridoma generation process for monoclonal antibody discovery. Maintain a sterile environment. Standard aseptic techniques are recommended to avoid contamination during use. Thorough, repeated washing. BTXpress Cytofusion Medium C, is a low conductivity medium designed for efficient electrofusion. Trace amounts of high conductivity solutions such as PBS or tissue culture growth medium can disrupt the fusion process. Therefore, it is critical to wash the cells thoroughly with BTXpress Cytofusion Medium C prior to the fusion process. For up to 5 x 107 cells, at least two washes in BTXpress Cytofusion Medium C are recommended. For more than 5 x 107 cells, at least three washes are recommended. Room temperature electrofusion. For maximum efficiency cell fusion, use BTXpress Cytofusion Medium C at room temperature. Cell washes prior to the final wash may be carried out at 4°C. Minimize time in buffer. While Cytofusion Medium C is non-toxic, it does not contain nutrients to support cell viability over long periods of time. For best results, minimize the time that cells are suspended in BTXpress Cytofusion Medium C. It is not recommended that cells remain in BTXpress Cytofusion Medium C longer than one hour subsequent to the final wash.
5:1 direct dilution. Post-electrofusion, cells in BTXpress Cytofusion Medium C can be diluted in cell culture medium without washing the cells. A minimum dilution of five parts complete culture medium to one part BTXpress Cytofusion Medium C is recommended. Alternatively, cells may be washed in growth medium to completely remove BTXpress Cytofusion Medium C prior to culturing.